There's more water than just what you can see. You see water all around you every day as lakes, rivers, ice, rain and snow. There are also vast amounts of water that are unseen—water existing in the ground. And even though groundwater is unseen, it is moving below your feet right now. As part of the water cycle, groundwater is a major contributor to flow in many streams and rivers and has a strong influence on river and wetland habitats for plants and animals. People have been using groundwater for thousands of years and continue to use it today, largely for drinking water and irrigation. 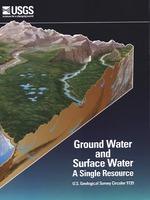 Life on Earth depends on groundwater just as it does on surface water. There are rivers flowing below our feet ... a myth? Have you ever heard that there are rivers of water flowing underground? Do you think it is true? Actually, it is pretty much a myth. Even though there are some caverns, lava and ice tubes, and horizontal springs that can carry water, the vast majority of underground water occupies the spaces between rocks and subsurface material. Generally, water underground is more like water in a sponge. It occupies the spaces between soil and rock particles. At a certain depth below the land surface, the spaces between the soil and rock particles can be totally filled with water, resulting in an aquifer from which groundwater can be pumped and used by people. Some of the precipitation that falls onto the land infiltrates into the ground to become groundwater. If the water meets the water table (below which the soil is saturated), it can move both vertically and horizontally. Water moving downward can also meet more dense and water-resistant non-porous rock and soil, which causes it to flow in a more horizontal fashion, generally towards streams, the ocean, or deeper into the ground. If groundwater wants to be a member in good standing of the water cycle, then it can't be totally static and stay where it is. As the diagram shows, the direction and speed of groundwater movement is determined by the various characteristics of aquifers and confining layers of subsurface rocks (which water has a difficult time penetrating) in the ground. Water moving below ground depends on the permeability (how easy or difficult it is for water to move) and on the porosity (the amount of open space in the material) of the subsurface rock. If the rock has characteristics that allow water to move relatively freely through it, then groundwater can move significant distances in a number of days. But groundwater can also sink into deep aquifers where it takes thousands of years to move back into the environment, or even go into deep groundwater storage, where it might stay for much longer periods. Sometimes when you dig a hole ... watch out! If an aquifer is under enough pressure, an artesian well tapping the aquifer can result in pressurized water shooting above the land surface. Bottled water is a very popular beverage nowadays all over the world. Sometimes it is because the local drinking water is of lower quality and sometimes it is just a convenience. Some bottled water is advertised as "artesian well water". Is the water really any different than other groundwater? Artesian well water is not really different from non-artesian well water - but it comes to the surface in a different manner. In the diagram above, you can see that there are unconfined and confined aquifers in the ground. The confinement of water in an aquifer, which can result in pressure, determines if water coming from it is artesian or not. Wells drilled into confined aquifers can yield artesian water. Unconfined aquifers: In unconfined aquifers, water has simply infiltrated from the surface and saturated the subsurface material. If people drill a well into an unconfined aquifer, they have to install a pump to push water to the surface. Confined aquifers: Confined aquifers have layers of rock above and below it that are not very permeable to water. Natural pressure in the aquifer can exist; pressure which can sometimes be enough to push water in a well above the land surface. No, not all confined aquifers produce artesian water, but, as this picture of an artesian well in Missouri, USA shows, artesian pressure can force water to the surface with great pressure. So, in what way is bottled artesian well water different from other well water? Mainly, the company that bottles it doesn't have to go to the expense of installing a pump in their well. As these charts show, even though the amount of water locked up in groundwater is a small percentage of all of Earth's water, it represents a large percentage of total freshwater on Earth. The pie chart shows that about 1.7 percent of all of Earth's water is groundwater and about 30.1 percent of freshwater on Earth occurs as groundwater. As the bar chart shows, about 5,614,000 cubic miles (mi3), or 23,400,000 cubic kilometers (km3), of groundwater exist on Earth. About 54 percent is saline, with the remaining 2,526,000 mi3 (10,530,000 km3) , about 46 percent, being freshwater.